The trend of covering one of your residential or commercial vehicles in a vinyl car wrap is currently on the rise in popularity. Most consumers quickly come to understand that a vehicle wrap is a more affordable and creative option when compared to the standard paint job. 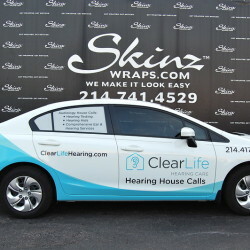 From standard cars to large vans, the wrap professionals at SkinzWraps, Inc. have been able to put our innovation to the test on Dallas’ vehicles. Read on to find out our top four hottest trends that are guaranteed to get you and the ride you are in noticed. The easiest way to show off your style is to change the color of your car. However, when choosing a paint job, you best be prepared for semi-permanence, because if you change your mind, the reversal and re-painting process can be expensive. Using the expertise of a car vinyl wrap company, you can change up your color while not having to worry about a huge commitment. We understand that people change their minds, and that is why a custom car wrap is so simple and affordable to replace. If you run a business and need all of your vehicles in your fleet to have a similar look, make the economic move of a vinyl wrap. At SkinzWraps, no job is too small or too large. We are committed to helping our clients make their wrap everything that it needs to be for them. Whether that be a brand endorsement, or if they just have a larger vehicle size that needs to be wrapped. Speaking of business owners, one of the latest trends is to wrap company vehicles in specifically designed wraps that display information about the company and serve as an excellent form of mobile advertising. This type of wrap can commonly be seen on a food truck or a business displaying a high resolution and recognizable logo. Remember, the right car wrap professional will be able to help you design a wrap that represents your business but doesn’t overcrowd it with too many words and information. Find a company that will help you keep your brand advertising simple and effective. It isn’t just business that is into designing stellar car wraps. SkinzWraps, Inc. has been pleased to create some very intricate designs for our residential clients looking for a change. From flames to cammo, to even the American Flag, we have the ability to make your dream design a reality that gets you attention! When you work with us, you’ll find that getting a high quality wrap in Dallas/Fort Worth has never been easier. At SkinzWraps, Inc. we are ready to complete your car or truck wrap in a professional fashion that will beat out the look of any paint job.